La Muerte está en el Ojo . . .
One of my favourite days of the year is The Day of the Dead. I can’t explain it. I know that many folks think that it’s positively morbid, but just the thought of it cheers me. Maybe it’s all the colours, maybe it’s just the silliness of it all. It’s part of the culture of Mexico. They treat death in a whole different way. The dead are friendly characters. There’s nothing sad or morbid about it. It started in prehistoric Mexico as a way to honour children and the dead. There was even a “Lady of the Dead” who protected the children and the dead. The soul of the departed was brought back to the bosom of its family. La Dia de los Muertos was originally celebrated in July, but the priests who came with the conquistadors decided that it would be better to celebrate the pagan holiday to coincide with All Soul’s Day, the 1st of November, in order to make it more Christian. 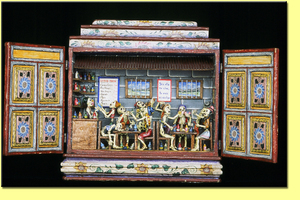 What I like best are the little confections that are made to look like skeletons and skulls. Sometimes they’re made out of pan dulce, sometimes just sugar. Of course, happening right after Halloween, I usually have my quota of sugar by then. Vienna is a very contradictory city. It’s beautiful to look at and it has some of the best art around. At the same time is has ghosts that seem to dog your steps and permeate the air you breathe. We had gone there for the beauty and ran smack dab up against the past. Grams had misgivings about visiting Vienna. She swore long ago not to visit any country that had in any way collaborated with the Nazis. I quietly pointed out that would severely limit our vagabond ways, and that much of Europe including France and Italy would not be destinations. That did it for her. But, it did take a while to get her to Austria. That said: Vienna was everything we thought it would be and nothing that we expected. Yes, that statement is at odds with itself, but I will explain. The art was there. The buildings in central Vienna, many rebuild from the devastation of WW II, were beautiful. The buildings constructed after the war, many of which were chock-a-block huge concrete monstrosities, were generally hideous. It’s the only word I can find to describe them. Our hotel room, high in a promontory overlooking the city, afforded us an unobstructed view of row after row of these odes to ugly. 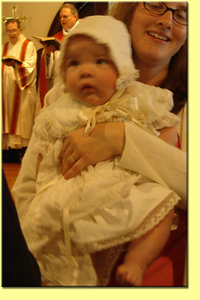 It made me long for the phony baloney Spanish of our little Santa Tourista. Ah, but the art. Vienna not only is a depository of some of the world’s greatest art, it has some of the most exciting contemporary art around. 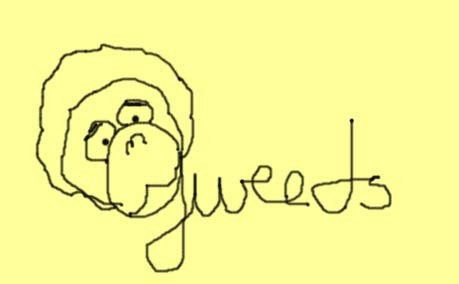 The piece in the photo is an example. We were on a quest to find as many Klimts and Schieles as we could when we happened upon the foyer of another museum. We had to climb a bit to get to the entrance, so I plunked my bum down a convenient bench. I was rubbing my feet when Grams elbowed me and said, “Look up!” That’s what I saw. Isn’t it gloriously silly? It looked like a giant light bulb to me. 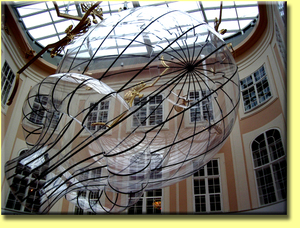 There is was, just floating above the foyer. As it turned out, there were no Klimts there, but I was able to spend a few minutes with a bit of whimsy that pleased my eye and brightened my day. *Beauty is in the Eye . 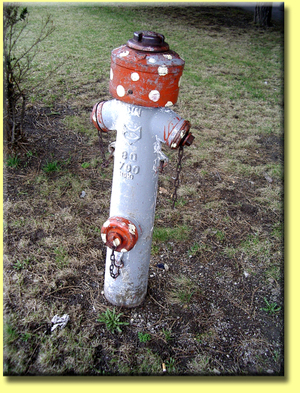 . .
Ah, the lowly the fireplug. In the United States, fire plugs are taken for granted. They’re on every corner. Sometimes they leak. Sometimes the firemen come ‘round and test them to make sure that they’re in working order (the fire plugs, not the firemen). Sometimes, city children will open them them on a hot summer's day and run through the water. The ubiquitous fireplug just sits there waiting for the moment when it's needed to do its job. Sometimes people get playful with the old fire plug. Its shape does, after all, lend itself to certain amount of anthropomorphism. Its got a little head at the top and a couple of little arms. Sometimes it has a little extra knob down there, but I’m not going to get into that. In the U.S. the fire plugs tend to be squat little things, usually a bright yellow colour. But they’re different all over the world. Some countries don’t even have them. In Wales, for example. This is something that I’ve never noticed, I have to say. It was when Marian and Emlyn came to visit us and Marian asked, “What’s that?” She was pointing at a fire plug. “It’s a fire plug, silly,” I said. That’s when she explained that there aren’t any in Wales and didn’t I ever notice that? She made me promise to take some photos of our fire plugs and email them to her. So, when we got to Vienna, I grabbed Marian’s hand as we left a museum and pointed this one out. Not only was it a wonderful shape, it was painted in a gloriously silly way. You never know what’s around the next corner. I was getting ready to write about a fireplug in Vienna, when I ran across these photos from the weekend. We had biked down to the slough and, not for the first time, I realized how much the scenery looked like something out of a Monet painting. 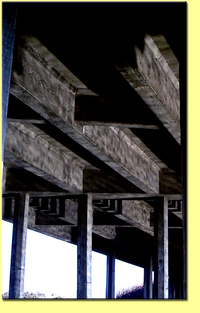 Then, I turned back and got this shot under the bridge that crosses the slough. The water was so still in the creek, and it shimmered on the underpinnings of the bridge. Just I was getting that shot, Big Guy said, “Look over here, Gweeds!” That’s when I saw the ‘plein air’ palms. It was such a California shot. The palm trees mark the spot of one of our favourite restaurants. 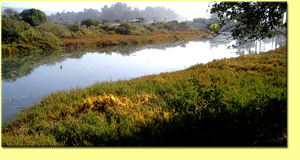 It’s right on the beach where the slough empties out into the ocean. I know why it’s Grams’ fave: they make wicked Key Lime martinis. Every time we go there, I always think about the time when Henri was very little and he chased a mouse around the outdoor patio. Since the El Niño storms of a few years back, the mice can’t get into the patio anymore. The wave action was so huge that the patio just about washed away. So, they built a short concrete wall all the way around the patio. 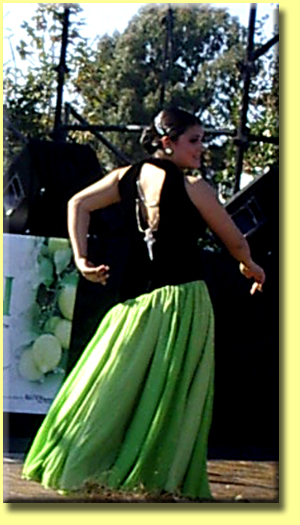 The last pic is from the Lemon Festival. 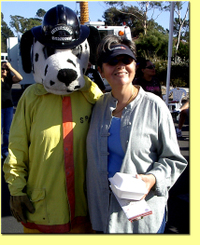 That’s Grams with Sparky the firedog. Can you guess what she’s holding in the box? Yup, it’s a piece of lemon cream pie. Yum! 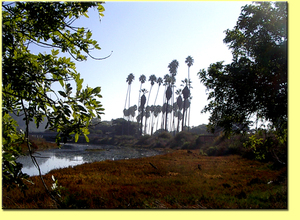 It's funny about the Monet slough: sometimes what you're longing for is right there in your own backyard. Sometimes, when we’re travelling I find that my short legs keep me at the end of the line. I just can’t seem to keep up with Big Guy and Grams. But, this unfortunate circumstance of heredity has allowed me to see things that others might miss. This photo is a case in point. We were strolling around the grounds of the Schönbrunn Palace in Vienna, when I saw this statue. Why it was covered up, I’ll never know. 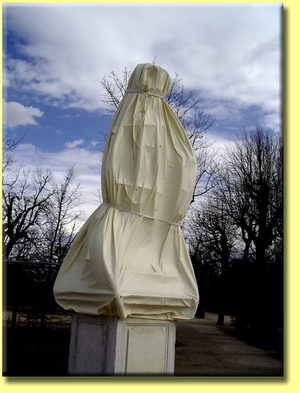 I thought that maybe in the winter the statues were covered up to protect them against the elements. But, it was spring. As a matter of fact, it was almost Easter. Maybe, the cover comes off on Easter Sunday. As I said, I’ll never know. By the way, doesn’t that sky look great? I was gobsmacked every day that we were in Vienna by the skies. The weather moves very fast through Vienna. The storms are fierce and the clearing skies are amazing. Frankly, I was expecting leaden skies after watching, “The Third Man.” Grams had made me watch it before we went. Needless to say, I was very pleasantly surprised by the beauty of it. Ooooh, all this makes me think of Sacher Torte. Yummy, yummy chocolately Sacher Torte. The day started out without much promise. It was foggy again. Grams talked me into riding in her basket on her bike (yes, I’m a fool). This time we went up the highway all the way to the old gas station. This station was built in the early part of the last century. It’s that classic phoney baloney Spanish style that proliferates throughout Santa Tourista. Of course, this is out in the sticks, far from the hubbub of the big city of ST. I love this building. It’s supposed to have been restored, but that was promised years ago and nothing has happened yet. We had delicious chili for lunch and then headed off to the Lemon Festival. Lemons used to be a big crop in Santa Tourista. Naturally, the trees were mostly cut down and replaced by homes a long time ago. So, every year the locals celebrate the memory of the lemons with a festival. There’re lemon bars, lemon pie, lemonade, lemon beer, lemon ice cream, lemon pizza: well, you get the drift. We usually go to see our neighbour’s daughter dance. She is a Spanish dancer. She also plays the saxophone and the piano. So, we sit on bales of hay and yell, “Ole!” and clap madly. That's her. Yes, I had a lemon bar and it was so very good. Well, here it is, Bean (aka Grant) is 2 years old. What happened to the time? How does it pass so fast? I can remember the day he was born as if it were yesterday. Now, he’s an adorable little towheaded 2-year old. 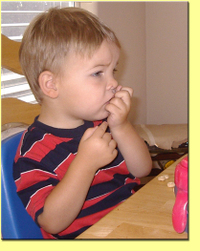 That’s him with his Cheerios this past summer. I want time to slow down just a little. It’s just whizzing by too fast. I think I’ll go have a bit of lie down in my hammock. My, my, my, time does fly. The 19th of October is the twin’s birthday: the ‘twins’ being Grams’ two older kiddlets. 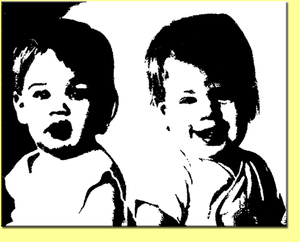 That picture of them is from a silkscreen Grams did for Christmas cards when they were 1 ½ years old. I’ve been sworn to secrecy about their age currently (not by them, by Grams!). All I can say is that the one on the right, affectionately referred to as ‘Buckets’ by Grams, is now an assistant U.S. Attorney. The one on the left, affectionately referred to as ‘Rockets’ by Grams has a degree in social work and is the mum of Andrea and Grant (often affectionately referred to here as ‘Andie’ and ‘Bean’). Obviously, the twins aren’t identical. Buckets is now 5’4” and Rockets is 5’8.” I could go on, but the differences aren’t important. They’re twins and so they’re joined at the hip. They even had their own secret language when they were little. They still talk to each other every day, and I’ll bet they still have some secret words. As to Grams, her favourite saying these days is, “I’m an old woman, I got confused!” I should be so confused: she still does the N.Y. Times crossword in ink. ** I wish that she’d make a cake for their birthday, even though they won’t be here, I'd enjoy it. Then, three days later, it’s Bean’s birthday. He’s going to be a big 2-year old. I’m starting feel a little old myself. So Happy Birthday babies – have one on me. **In the interest of full disclosure: she does this Monday-Thursday. She switches to pencil the rest of the week. “The spearman heard the bugle sound, And cheerily smiled the morn"
This photo always puts me in a thoughtful mood. 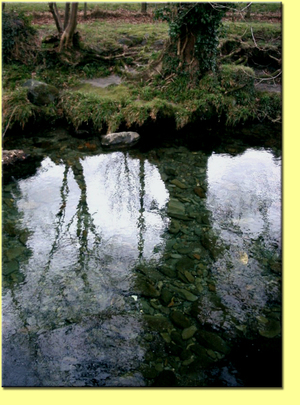 I took it in Beddgelert, in Wales. Beddgelert is a town in Snowdonia Park. It’s right in the shadow of Mt. Snowdon. The name ‘Beddgelert’ means ‘the tomb of Gelert.’ As the story goes, Gelert was a hunting dog of Llywellyn, a nobleman of Wales. This was back in the 1200s. So, it would make him contemporaneous with King Edward I of England, who at that time was busily trying to subdue Wales. Notice that I didn’t say ‘conquered.’ Wales has never been conquered, just occasionally subdued. So, Llywellyn went hunting one day without his faithful hound, Gelert. When he returned he saw Gelert covered with blood. 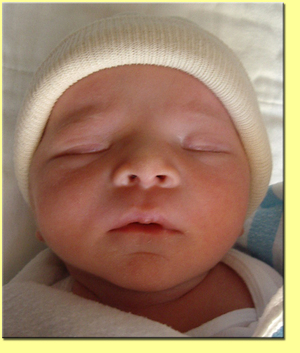 Worse than that, Lleywellyn’s baby son was missing. Lleywellyn immediately assumed that Gelert had killed the child. So, he killed Gelert. Just then, Lleywellyn heard a baby’s cry. In the bushes was his child in his cradle, and next to him was the body a huge wolf. Gelert had obviously killed the wolf to save the child. Lleywellyn was devastated. He rushed to hold the body of his lifeless dog in is arms. But no amount of sorrow or tears would revive Gelert. There is even a statue of the brave Gelert in Beddgelert. There’s only one problem: the fable was made up by savvy townsfolk, probably in the nineteenth century; who were trying to bring tourism to the town. The real Gelert was a saint, of the human variety, who lived there in the sixth century. Well, it’s a nice story and the town is beautiful. Marian and Emlyn decided to bring us here because the Grams had been listening to the BBC on the internet and she had heard about gales and the flooding of Beddgelert. She had picked up the phone and immediately called Marian and Emlyn. We arrived a few weeks later and nature had recovered, as you can see. Dying for no reason, is there anything worse? Now, where was I before I was so rudely interrupted? Ah, yes I was thinking about carousels and their contradictory nature. For a few wonderful minutes they go ‘round and ‘round. The horses strain at their bits, glorious cherubs flit overhead, and beautiful half-naked women look down lovingly. Sometimes, there’s even a golden ring we can try to grasp for a free ride the next time. Of course that ring is just out of our grasp. I suppose there are some who can reach that far, but I’ve never been able to. And those horses panting and straining are going nowhere but back to where they started. The heavenly music will stop and we have to get off and watch the next lucky riders go ‘round. But, for an ecstatic few moments we will race the wind on a magnificent steed and pretend that we are actually going somewhere. 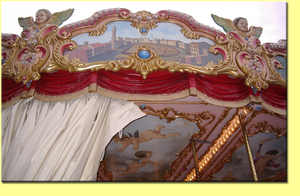 This carousel was in the Piazza della Repubblica in Firenze (Florence), Italy. It isn’t permanent and seemed to be there especially for the Easter season. 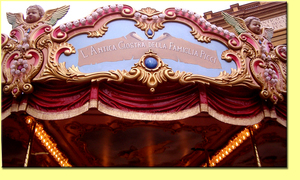 As you can see, the family, Picci, just like the other family (G. Theo et fils) in Paris; had their name proudly painted on the frieze. Grams had lingered back at the edge of the Piazza; she was having one of her painful days. A fellow came up next to her. He was talking on an imaginary mobile phone. In rapid-fire Italian he was telling someone why he couldn’t meet them. Grams got to laughing so hard, she forgot her pain. 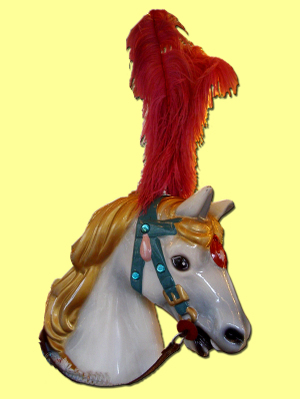 Soon she joined me at the carousel and we sat and laughed some more. Big Guy, Marian and Emlyn had gone to the far side of the Piazza to listen to a beautiful Russian singer with her accompanist. We joined them and clapped heartily. What a wonderful day. You never know what you’ll find around the next corner.